Good morning SOTGC readers. It is with great pleasure that I introduce you to Scot Elder Esq. 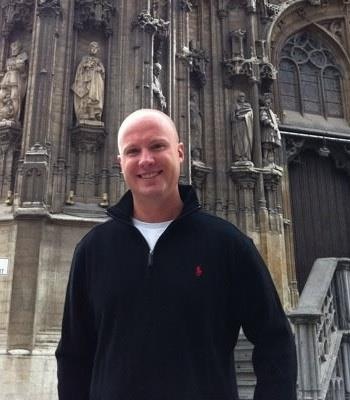 Scot is the Senior Legal Council and Compliance Officer for Medtronic’s Surgical Technologies division. I met him at our first National Sales Meeting after the acquisition. I believe he had an hour long presentation slated either before lunch or at the end of the day. Either way, can you imagine what a fun spot that must be when you’re the only thing separating two hundred sales reps, managers, and vice presidents from lunch or happy hour? Turns out I was wrong! Scot is and has been one of my favorite presenters. He imparts both the emphasis on being diligent and responsible medical device sales representatives, and a ton of humor. I think I laughed more during his presentation (not at the subject matter but at his dry sense of humor and wit) than I have for any other presenter I’ve seen. He is approachable and always helpful when answering questions I have regarding potential situations. I hope you enjoy this interview as much as I’ve enjoyed his countless emails to the salesforce on compliance reminders. I believe everyone has a trait or set of traits to be admired or at least from which I can learn. “You can learn something from everyone, even if it’s what not to do,” as Abraham Lincoln said. I try to approach people that way. Looking for only “the one most admirable trait” in everyone is like looking for the coldness in every snowflake. I’m decisive. For some reason, I have the ability to perform a thorough analysis, consider the available options and come to a decision fairly quickly, which is critical for me in my job, in particular, because “paralysis by analysis” is not an option for me. As one of my heroes, the legendary UCLA basketball coach, John Wooden, said, “Be quick, but don’t hurry.” I try to live by that adage whenever it’s appropriate and possible to do so. I read an article in the Wall Street Journal a few months ago that stated that women land something like 53% of entry-level jobs. But then, female presence seems to fall off a proverbial cliff – to 35% at the director level, 24% among senior vice presidents and 19% in the C-suite. In exploring the reason for this phenomenon at Google, for example, it was found that while men typically jump at the chance for promotions, women “need to be prodded” to nominate themselves. With all the factors weighing against women in the workplace nowadays, a woman being her own worst enemy might be one of them, which is a damn shame. Women clearly still have to fight against biases and the “old school” way of thinking from men who are in a position to make decisions regarding her career. I have seen executives who still operate like it is 1962, unfortunately. This needs to stop if women are ever going to have a fair shake. I’m in no position to even pretend that I have the life experience or wisdom to provide the answer to this question. I learned long ago to keep my mouth shut on matters I know nothing about. “Eleventh Month, Eleventh Day, Eleventh Hour: Armistice Day, 1918, World War I and Its Violent Climax,” by Joseph Persico. It explores the causes of the “Great War”, but also describes in the last several hours leading up to the cease fire – both sides essentially needlessly slaughtered thousands of their own men even after an agreement had been signed. It’s essentially a case study on human behavior in its most vulgar and raw form. There are too many to even begin to count, which is perhaps the most inspirational thing for women that I can think of – because it wasn’t too terribly long ago that there were only a handful of women who had achieved a great deal in the workforce and they were always classified as “pioneers.” You see this term less and less – and I think that is a good thing, frankly. Confidence grounded in acute self-awareness. Honesty. I tell my kids to tell the truth because it’s the right thing to do. Period. There are many things that I can list here: to live in accordance with my own values; to see my sons grow up to be good men and see their goals come to fruition; to love and be loved by those who are important to me to my last breath. That’s my idea of happiness. See my answer above regarding what my idea of happiness is and plug in the opposite values. See my answer above regarding what I believe the hardest lesson for working women to learn. I have had a few, but they were all rooted in my own unrealistic and misplaced attitude that I felt that I was entitled to success without putting in sustained hard work over a long period of time. I am not sure if this is a male oriented regret or even one that is shared by women, as well, so much as it was a product of youth and inexperience. I recently read David McCullough’s most recent work, “The Greater Journey: Americans in Paris,” which explored the group of adventurous American artists, writers, doctors, politicians, architects, and others who set off for Paris in the years between 1830 and 1900. McCullough described the experiences of this amazing woman, Elizabeth Blackwell, who was the first woman to graduate from medical school and was a pioneer in educating women in medicine. She was rejected by all the leading schools to which she applied and almost all the other schools as well. When her application arrived at Geneva Medical College at Geneva, New York, the administration asked the students to decide whether to admit her or not. The students, reportedly believing it to be only a practical joke, endorsed her admission. When they discovered that she was serious, both students and townspeople were horrified. She had few allies and was an outcast in Geneva. At first, she was even kept from classroom medical demonstrations, as deemed “inappropriate for a woman.” Most students, however, became friendly, impressed by her ability and persistence. Elizabeth Blackwell graduated first in her class in January, 1849 and eventually, studied in Paris was appointed professor of gynecology at the London School of Medicine for Children. An unbelievable story of persistence and success in the face of bigotry and unbelievable odds. Persistence, Confidence, Intelligence, Courage, and Compassion. My Mom grew up thinking of doing nothing other than being a stay-at-home mom and went out into the workforce only because she had to for financial reasons. But I think we were generally raised to achieve their own goals first, regardless of whether we were male or female – and if their daughter’s goal either did or did not include being a mother than that was fine. Don’t let someone else’s expectations for you govern your own.